Hello my name is Meagan Burns and I'm an artist who loves to travel. I'm from Chicago yet live in San Miguel de Allende, and occasionally I've traveled to Guanajuato to learn printmaking, sketch in the streets or enjoy the change of scenery. 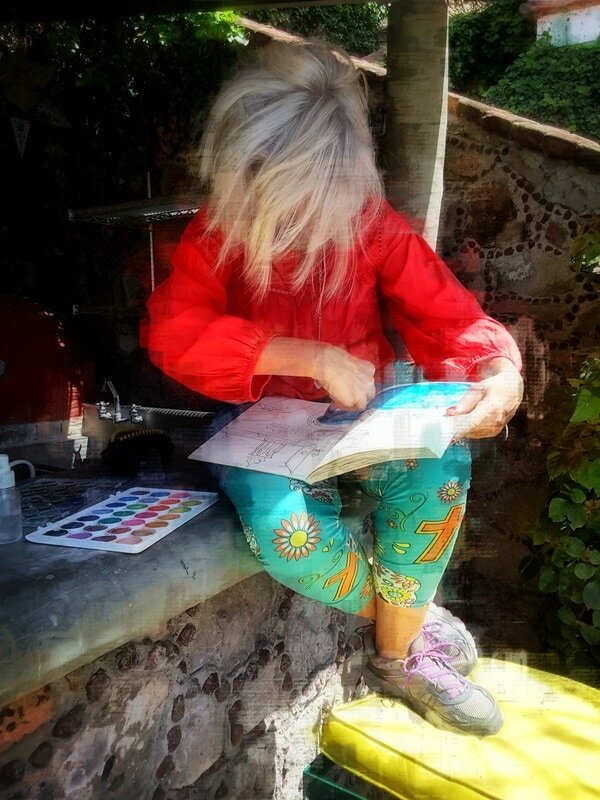 Upon my return to San Miguel, friends would ask if they could join me on my next Guanajuato adventure, so I decided to lean into my favorite hobby and begin organizing art workshops in Guanajuato, Mexico with my pals. Word spread fast! I've created and hosted more magical workshops in Guanajuato, Patzcuaro, Mexico City and right here in my adopted colorful hometown of San Miguel de Allende. My focus is Mexico right now, but I have every intention on seeing the world through my art -- care to join me? I'm also the admin for the local Urban Sketchers Regional Chapter in San Miguel de Allende, we are a group of dedicated sketchers from a wide range of backgrounds, who get together each week at a different location to sketch and learn from each other. We share our work online, and work together to create monthly sketch events; it's been a wonderful opportunity to meet new people, learn new tricks, and see my world, one drawing at a time. You can request to join the Facebook Group here and learn more about Urban Sketchers here. We all have an opportunity to surround ourselves with art and pretty pictures, but it became incredibly more meaningful to me when I began creating my own art. It is a form of meditation for me, when I draw, the world around me begins to organize itself in a way I can see it and understand it better, which helps me to organize across the board in my life. When I draw, I calm down. It has changed my life and I want be be able to share the opportunity for others to discover and give a voice their authentic creative self. You may be completely surprised by what you learn, you may begin to see youself in a whole new light. Becoming an artist has changed my life and I bet it will change you too! ​I have many years experience working as a producer of corporate events, a graphic designer, restaurant marketer, and a grass-fed beef producer. I understand the big picture of producing events and have a keen eye to keep all the parts moving; I am thrilled and grateful to be producing events in Mexico, my adopted hometown. I invite you to contact me if you're ready to leap into an art workshop in a beautiful destination, no experience necessary. You may also contact me if you are an educator and want to create a travelling workshop experience, our voices can ring truer when we gather first to discover our talents!